This week we are going to continue our love of ‘rhyming words’ and read a book that has a very rhymey title – ‘The Wonky Donkey’ by Craig Smith. This was originally a song so we’ll enjoy that throughout the week as well! Listening Skills – Read ‘The Wonky Donkey’ by Craig Smith to your child. Really have fun with how you read this – when I read it to the kids in my class I went over the top with the ‘Hee Haws’ and by the end of the book most children would join in. This is what you want your child to do as well – the repetitive text will help their memory. Vocabulary – After reading the book, you need to talk about the vocabulary in the book. There are several words that your child may not understand. In the classroom, I would go through the most repeated words first such as wonky, lanky and cranky. Act out these words with your child so they remember the meanings of these words. Discuss what sort of expression you would have on your face for each word you talk about. Also discuss the meaning behind ‘and that morning he’d got up early and hadn’t had any coffee.’ Inferring (ideas that are suggested by the author or illustrator but are not ‘right there’ in the text) is a comprehension skill many children have difficulties with so discuss what happens when you get up early as well as what happens to some people if they don’t have their early morning coffee. Latte, anyone?! See how many things you can remember in a row! Comprehension Strategies – I first saw a version of this next great activity being done by a fantastic teacher in a Year 6 classroom – but it’s such as good one, it can be used at any age! Place a bookmark on each of these pages so you know which ones to flip to. Then read your first page to your child and get them to listen and draw the image they hear. Then go to your second page, read this to your child and have they draw the image in the second box so on and do the same thing. As the details become longer you may have to reread the page several times to your child. Get your child to tell you what is in their picture to make sure nothing is missed out. Remind them it’s not a drawing competition it is a memory challenge! When all four pictures have been drawn, talk about how the donkey changes in the story. Why does the donkey change? Because we keep getting more information. Keep this piece of paper as a plan for Friday’s activity. Fine Motor Skills – Little fingers are still growing and getting stronger in junior primary. So doing activities to strengthen them help with things like handwriting. Using homemade play dough or shop bought clay, mould the body of the Wonky Donkey. Your child may enjoy having a bit of a play with the play dough before they get into making the Wonky Donkey. Have on hand other craft items so your child can make some of the accessories from the story like sunglasses (pipe cleaners perhaps?). You might use your Wonky Donkey to retell story. If your book came with a CD, play the song or download the song (details should be printed on your book). This is great!! My daughter and I spent a rainy afternoon reading, re-reading, talking and doing these activities together. 🙂 Thanks so much! 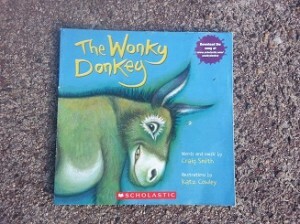 My daughter loves the Wonkey Donkey and I am hoping to play her the song now. All the best. Thank you so much for your comment! The Wonky Donkey is such a great book. I have read it to classes of 6 years olds and classes of 11 year olds and everyone seems to enjoy it! I found if you do a search for ‘Wonky Donkey Activities’ or ‘Wonky Donkey Colouring In’ (look in images) there are many more great activities to get you through a few more rainy days.